Descartes has acquired Computer Management, a leading US-based provider of security filing solutions for customs and air cargo management applications. Computer Management provides its customers with comprehensive security filing solutions geared towards air carriers and their partners around the world. Growing Descartes’ global multi-modal logistics community by adding hundreds of additional ground handlers and container freight stations connected to the airlines. 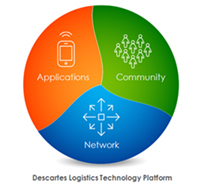 Descartes’ Global Logistics Network (GLN) is the foundation on which the applications and community are built. The GLN provides community members the flexibility to easily connect and collaborate with global trading partners. The Computer Management acquisition increases the scale of Descartes’ network in the global security filing market. Descartes’ product strategy is focused on expanding its logistics application functional footprint to provide its customers with the most comprehensive logistics management solutions in the industry. Computer Management has been developing its air cargo management applications and security filing solutions for more than 15 years. The acquisition will strengthen Descartes’ Customs and Regulatory Compliance platform with additional functionality for airlines and their ground handling agents (including container freight stations). The combination of Descartes’ global security filing framework and Computer Management’s airline-focused solutions provides a compelling platform for airlines and their partners to address the ever-changing regulatory environment (ie. ACAS for the US, e-manifest for Canada, PRECISE for Europe). Descartes’ logistics community is the largest multi-modal network of logistics intensive companies in the world, with over 220,000 parties using its cloud-based services in over 160 countries. It is Descartes’ mission to create the world’s most comprehensive networked logistics community. The acquisition will add hundreds of ground handlers and container freight stations that are connected to the airline community. New York based Computer Management provides the cargo community with solutions to improve cargo management, including security filing solutions (AMS, ICS, etc). Computer Management’s comprehensive security filing solutions are geared towards air carriers and their partners around the world. Specifically, Computer Management’s solutions help air carriers to improve operational efficiency and streamline security filing and customs clearance processes, directly and through coordination with ground handlers and container freight stations. The acquisition makes Computer Management’s customers members of the world’s premier global logistics community – The Global Logistics Network – facilitating improved performance and productivity of logistics operations around the world. As part of this community Computer Management’s customers will have access to additional solutions via Descartes’ Logistics Technology Platform to improve rate management, dock appointment scheduling, transportation management, routing and scheduling, and in-transit inventory visibility. Computer Management customers will also have access to a wider geographic range of customs filing services around the world.